I was up at Pixar last week covering Finding Nemo 3D and Partysaurus Rex, the latest “Toy Story Toon” short that will screen in front of the stereoscopic Nemo in a limited theatrical engagement on Sept. 14. The trailer has been released and is indicative of the hilarious fun. 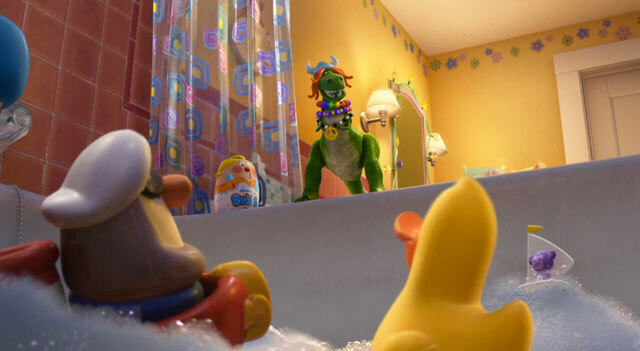 Directed by Mark Walsh, Partysaurus Rex has party pooper Rex (Wallace Shawn) reinventing himself during bath time with Bonnie’s toys. Kudos to Pixar Canada for upping its sudsy animation game in Vancouver. Meanwhile, Finding Nemo and Partysaurus Rex are headed for Blu-ray and Blu-ray 3D on Dec. 4 from Disney Home Ent.